To tell the story of A-WA, we have to go a few years back, to a family who lives in the small village ‘Shaharut’ in southern Israel. Not too far from the Egyptian border. In beautiful prairie landscapes with magical desert sunsets, Tair, Liron and Tagel grew up – three sisters (out of six siblings) of the Haim family. In their childhood home they listened to many different kinds of music, such as Greek music, Yemenite music, Jazz, R&B, Hip Hop, Reggae, Progressive rock and more. The inspirations that sustained them, and the warm musical home that encouraged them, have become the creative part and parcel of their lives. For the last two years, the girls, who initially were called The Haim Sisters, have been performing non-stop. They became an integral part of the stage composition of Balkan Beat Box’s MINIMAL tour. Later on they appeared with a band of their own and gave shows around Israel and in music festivals in Poland and France in front of an embracing audience, while at the same time working at the studio with producer Tomer Yosef. 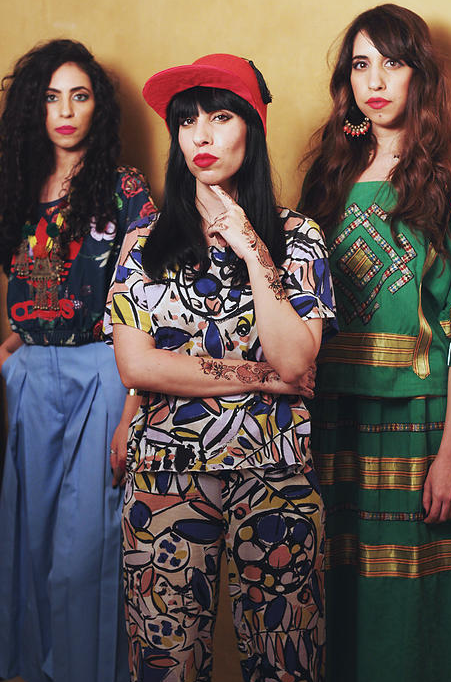 While searching for materials and in the spirit of fate that accompanies this story, one day the girls bumped into the song “Habib Galbi”, an old Yemenite song that they knew from childhood, but this time they heard the first original recording by the Yemeni singer Shlomo Moga’a. From there, a door was opened to a hidden treasure of ancient Yemenite women’s chanting, that was passed on from generation to generation for centuries and has been recorded a few times. Moga’a was one of the only chief curators of these songs and after passing has left a legacy, just waiting to be re-discovered. A-WA’s debut album includes 12 songs, composed entirely of original performances of these folk songs. In closely working at the studio with Tomer, the sound and the artistic statement were formed. And in cooperation with musicians like Tamir Muskat, Itamar Ziegler, Tom Darom and more, they created a composition of a unique identity with a lot of groove, electronics and a brand new global beat fragrance. You can choose whether to take the story behind the sounds to your A-WA experience. Even without dwelling on genetic loads or cross-generational folklore, A-WA sends a refreshing and authentic breeze of world music to the music scene in Israel and abroad. A happy, warm and genuine music, that starting this year is going to break language barriers and boundaries and bring a new message for those who love the genre and in general.